A green roof incorporates vegetation, soil or another growing medium, and a drainage layer over waterproof membranes as an alternative to an impervious roof surface. It is estimated that green roofs may eliminate 50% to 80% of roof runoff that otherwise would have drained to the storm sewer. The soil and vegetation absorb precipitation and release what is not used by plants or absorbed over several hours rather than the rapid runoff associated with direct storm sewer discharge from impervious roofs. Runoff volumes from frequent, small precipitation events are eliminated and runoff from larger events is reduced. A green roof provides air quality and aesthetic benefits. They reduce the heat island effect in heavily populated urban areas. 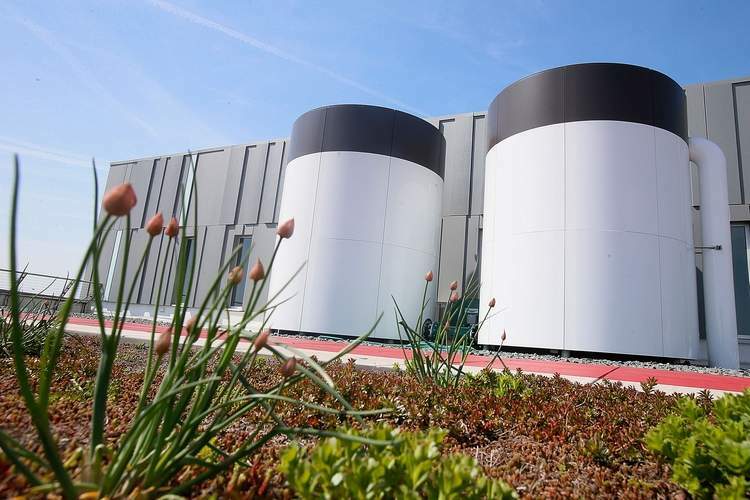 Green rooftops also improve the energy efficiency of buildings, especially for air conditioning when HVAC units are located on the roof as is often the case in large commercial or institutional buildings. It has been shown that air temperatures just above green roof sites are significantly lower than those above impervious roof surface sites. There are three main types of green roof systems, extensive, semi-intensive and intensive. Extensive green roofs are usually not accessible and are characterized by lower weight, lower installation cost, lower plant diversity, and minimal maintenance requirements. Modular systems that consist of a flat of sedum rooted in growing media can be installed. 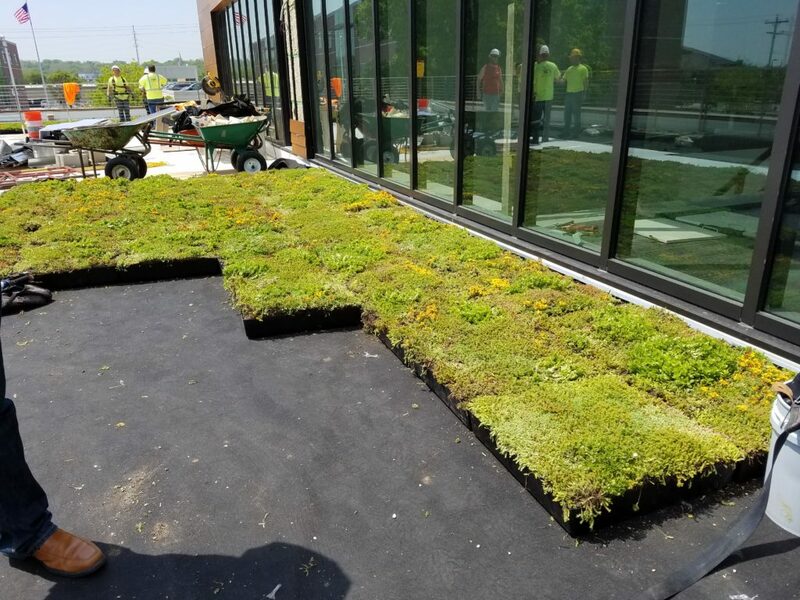 Semi- Intensive / Intensive green roofs are often accessible and are characterized by deeper soil and greater weight, higher installation costs, increased plant diversity, and have more maintenance requirements. Intensive roof systems often provide green space for leisure activities in an ultra-urban setting. Green roofs are more conducive to flat or gently sloping roofs. Design consideration must be given for the weight of the green roof. A root resistant waterproof membrane is installed to protect the building. Drainage is needed to handle the excess water flow from the roof. A variety of lightweight aggregates or a synthetic drainage framework is place on the waterproof membrane below the soil media. The types of plant materials used is dependent on climate, irrigation, maintenance, depth of media, and how the green space will be used. 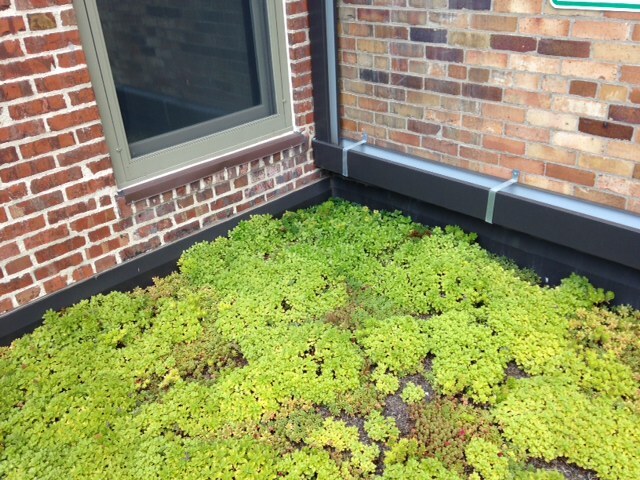 Shallow roof media requires more drought resistant plants such as sedums. Deep roof media expands the range of plants that can be used. Shrubs and trees are often included in intensive roof systems. Living walls, or green walls, are interior or exterior walls that are either completely or partially covered with plants, soil, or substrate. In addition to aesthetics, living walls can provide insulation to regulate air temperatures and purify air quality.